1. accumulate something - transitive verb to obtain information in small amounts over a period of time. Over 30 years ago, Gleaners was founded for the purpose of “gleaning” gently used articles for resale in order to support our local Creston Food Bank. Since then, thanks to a giving, caring community, we have become so much more. Gleaners, Gleaners Too and Gleaners Food Bank reside in separate buildings in Creston, BC (a town numbering just over 5,000 people) and each entity is a constant hive of activity from 6 am every morning, Monday through Friday, in the sort rooms of the various departments. Here you will find a full-time paid staff of two ( ! ), an on-call part-time staff for gate duty and fill-in for the paid staff, and a staff of 100 +/- volunteers who sort, clean, mend and allocate a treasure trove of donated products into three different categories of goods. Each volunteer works from three to forty hours a week, and some volunteers have worked for Gleaners for twenty years and more since it began in 1984. In Creston it is a matter of pride to say "I got it at Gleaners" or I gave it to Gleaners". 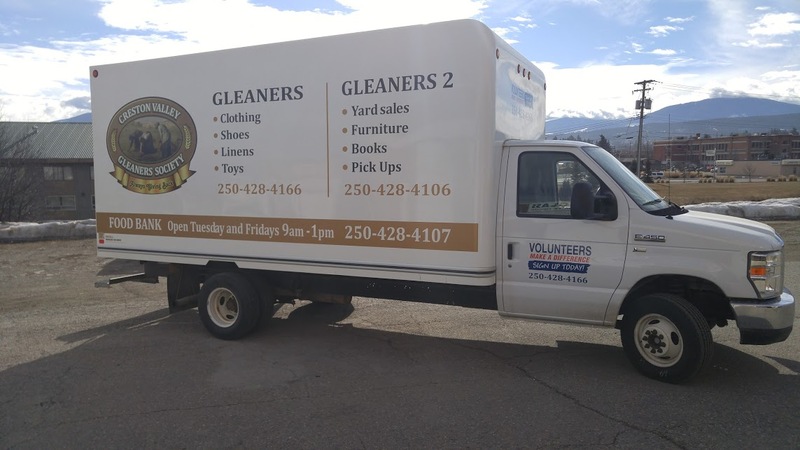 You often see the Gleaners truck about town picking up pieces for those who cannot take their donations to the Gleaners Stores. Gleaners is a wonderful example of community helping community. None of this would have been possible without the hard work and dedicated volunteers who contribute countless hours to the Society, along with the on-going support and generosity of the Creston Valley residents who have made it all possible.